Electric bike skiing? That’s right! Enjoy this video of a Pedego Trail Tracker set up with a “bike board”. The Fitness Shirt is a high tech shirt that can help optimize your workout by monitoring your heart rate and breathing in order to adjust the assistance from your e-bike. It is intended to help you stay in a certain exercise zone. Interesting….. Here is another article title I like: “OPINION: Let’s stop using the ‘c’ word”. That ‘c’ word is “cheating” and the article is a rant from an electric bike store owner who has some good points about how e-bikes are not cheating. Copenhagen is working on an electric bike share program: “The city hopes people will zip around on electric bikes instead of clogging the streets with cars”. Here is the full review of the EcoReco M3 folding electric kick scooter. This can be a great first and last mile commute solution when combined with mass transit. Thats it for now. 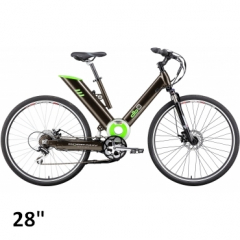 Stay tuned for more e-bike news and reviews! How bright are these lights when measured in lumens?